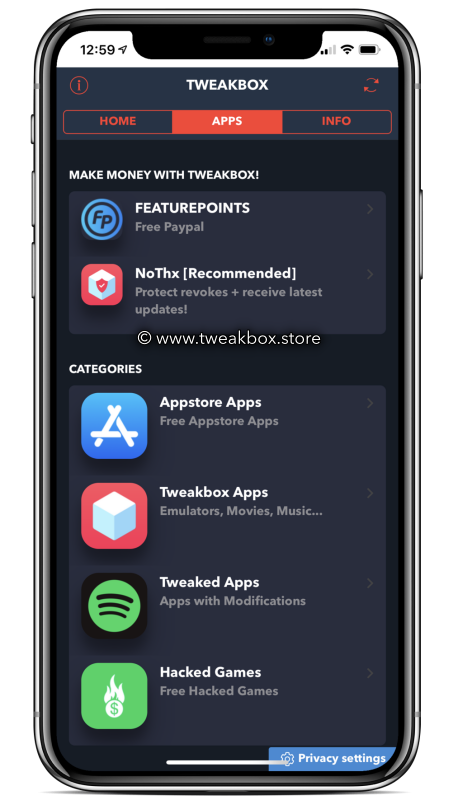 TweakBox is an unofficial appstore that offers apps and games that not only works on the iPhone; it also works on Android devices. Tap the install button below, and download the app directly on your phone. Android users can also download APK files from TweakBox app. More details in the download button below. Microsoft Windows PC and Mac OSX users can now also download TweakBox apps and games on their desktop and laptop computers. Using the app really is very easy. If you get the (Untrusted Developer) message, then follow the linked tutorial and TRUST the developer and start using the app. When you are already running iOS 12 on your iPhone which is a feature-rich mobile operating system, why would you want to download Tweak Box app? To understand this, we must first understand the fact that TweakBox is an unofficial app store (read About) that allows the 3rd party apps and modified games that do not get past the strict guidelines of Apple AppStore and Google PlayStore. This makes Tweak Box Store a haven for 3rd party Unofficial Apps. Tweak Box is 19% faster than its closest competitor, and 91% faster than Cydia, which is the original jailbreak app store for iPhone since 2008. Every app on the Tweak Box store goes through a 3-stage quality check. Apps are first tested continuously for stability by app developers themselves; then they are beta tested by experienced users on our Reddit channel. We do one final check before adding it to our appstore, letting only suitable apps pass the test. Our Twitter page is the fastest source of reporting rouge and non-working apps. Exclusive Apps – Best emulators, movie apps, screen recorders, and more. iOS 12 is the latest version of iPhone firmware from Apple, bigger and better than anything released before. Apple has security features throughout every part of iOS 12, but because Tweak Box does not require to access the root system of iOS, it is much safer and much easier to install and run on your device, without worrying about your device warranty being voided. Can you think of anything better than this? Not needing Cydia means that anyone can use TweakBox app without going through the complicated process of iPhone “jailbreak” or Android “rooting”, both of which invalidate your device warranty. Tweak Box is a great Cydia alternative for iOS users, and if you use it, you should think about using a VPN service too. TweakBox is a 3rd-party app store, so Apple will revoke your free Enterprise app certificate very often, making it stop working every now and then. With a VPN tool, you can prevent this from happening. A VPN service protects your app certificates, stopping them from being revoked, so you can use your apps and games uninterrupted.